The Fluoride mineral is one of the family of trace minerals and is one mineral that is surrounded by controversy. Much of the debate surrounding fluoride has to do with the benefits or otherwise of adding fluoride to drinking water supplies. On one side of the fence are those that feel the consequences of adding fluoride are negligible while on the other side are those who feel that any amount added is too much. Although the fluoride mineral is not considered as essential, it certainly plays a significant role in keeping teeth and bones healthy and strong. Fluoride helps in the fight against tooth decay. That's why it's listed as an ingredient in many brands of tooth paste. Teeth need a way to fight tooth decay and fluoride is the best weapon. As acid slowly eats through a tooth's enamel, the tooth's protective coating is breached, allowing harmful bacteria to grow and thrive. This situation may ultimately cause cavities to develop. The fluoride a person gets by regularly brushing the teeth helps make teeth better able to resist these acids. Fluoride also plays a role in the remineralization process. Remineralization, which is the process of restoring minerals that have been lost due to use or elimination, is especially important to bones. In the case of the bones, fluoride actually helps prevent mineral loss from occurring in the first place. Fluoride actually helps bones hold on to minerals more effectively. It's believed that this function plays a big role in protecting a person against the onset of osteoporosis. No recommended daily intake has yet been established for fluoride. The general consensus is that 1.5 mg/day for adults and no more than 2.5 mg/day for children is adequate. Fluoride sources are not at all common and the fluoride mineral is not found in many of the foods that we eat. That is why it has been added to toothpaste and some drinking water supplies. Using fluoridated water for cooking is another way to get this mineral inside the body. Drinking brewed tea that has been made with fluoridated water is another option. Canned fish, including their edible bones, such as salmon is also a good source of the fluoride mineral. A dentist will usually prescribe additional fluoride treatments, especially for children, to further help protect teeth from decay. Too much fluoride, especially in children, can lead to a condition called dental fluorosis, or mottling of the teeth. The main symptom of this condition is teeth that start to yellow. 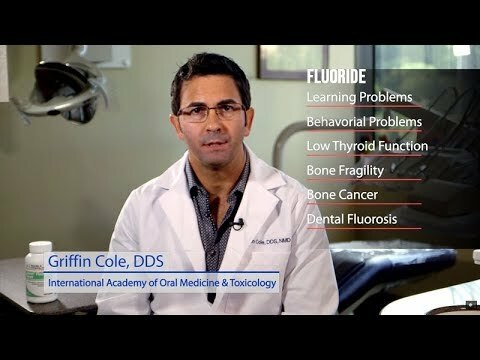 Too much fluoride can also cause bones and teeth to become brittle. Brittle bones are more likely to develop fractures. Excessive levels of fluoride over time can also lead to hyperthyroidism, a condition in which the body produces excessive amounts of thyroid hormones. Much of the debate over adding fluoride water involves the potential risks associated with over-consumption of this mineral. The most obvious sign that a person has a fluoride deficiency is the appearance of dental carries, better known as cavities and weakened tooth enamel. Brittle bones which generally are caused by bone demineralization are also a symptom of fluoride deficiency. This situation can lead to a higher likelihood of developing bone fractures and possibly even osteoporosis.